When they lie, they go for the REALLY BIG LIE. Never mind your lying eyes. Never mind the statistics compiled by the NC Department of Public Instruction: there are presently, because of the Republican budget, 915 fewer teachers in classrooms and 2,042 fewer teacher assistants. But never mind the actual truth. 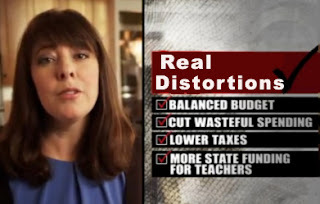 The low-information voters of North Carolina need their own alternative reality, and the billionaires are all too happy to supply it ... the rosy BIG LIE told by the innocuous-looking young woman with the earnest face, and this is only the beginning of what's ahead of us this year! The teachers aides and other education employees fired by the sly republicans should all gather together on the General Assembly's steps; if they have the means to get there, being out of work, that is. And don't forget the travesty of the early childhood gutting. A shame on our state, the 49th in per pupil spending. Our collective thank you to these republicans should be voting them out in overwhelming numbers for our children's sake. Yes, I think they should have cut the bloated, top-heavy, overpaid administrative positions in several departments and not the modestly paid people who actually do the work. I think they should have been far more prudent re: their overspending of the last many years on unneeded tracts of land, etc, and several building projects that has cost far more than promised, which has resulted in jobs being cut in the end. Don't you think so Jerry? first anonymous does make a good point. NC was 49th in per pupil spending according to the previous info provided by the NCAE. Of course that was under a DEMOCRAT legislature. Last year we had moved up to 43rd. Now that number was provided by the NEA so it could be biased.